Next year will see Buxton International Festival enable tour operators to offer their customers three operas in two nights or four operas in three nights with a programme which includes a world premiere and some evergreen favourites. Buxton celebrates its 40th anniversary in 2019 with a new work which reflects a milestone in the restoration of the spa town’s development as the refurbishment of its Georgian Crescent comes to fruition. And it also includes an exciting youth production which grew out of the South African townships where it encouraged a new generation to enjoy opera. The world premiere is Georgiana, a newly commissioned 40th Anniversary opera pasticcio, celebrating the life and times of Georgiana Cavendish, the 5th Duchess of Devonshire, whose husband built the Crescent, which is being restored as a luxury spa hotel. Georgiana’s exciting and sometimes scandalous life formed the story for the Hollywood film The Duchess, starring Keira Knightley in the lead role. The Festival’s other made-in-Buxton unique productions will be Eugene Onegin, Tchaikovsky’s sweeping tale of unfulfilled love conducted by the Festival’s new Artistic Director Adrian Kelly, and Spontini’s La Vestale, a clash between the heart and duty in ancient Rome, conducted by Mark Tatlow. Ever-popular Opera della Luna will celebrate Offenbach’s 200th anniversary with their production of Orpheus in the Underworld. And the Festival will begin with a truly global partnership for the New Voices Gala concert featuring talented young artists from the Royal Northern College of Music and Cape Town Opera. 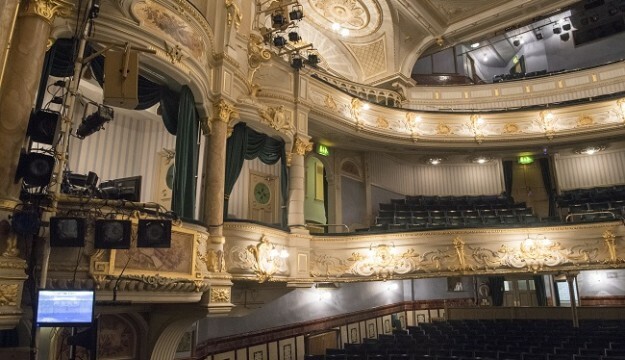 All opera performances will be in Buxton Opera House, designed by Frank Matcham, who also created The London Palladium and Blackpool Tower Ballroom. Discounts of ten per cent on bookings of over 30 are available. The Festival is also keen to encourage day trips. Visitors will be able to see the town and hear a book talk in the morning and an opera in the afternoon, or take in one of the many concerts. Wrapped around the programme but yet to be announced will be the high standard of classical, baroque and jazz concerts which Buxton has become famous for, including concerts by the BBC Philharmonic who will be recording performances for Radio Three. The Festival will also be mounting The Orphans of Koombu, an opera written to introduce young people to opera. The Koombu Project started in South Africa as a way of getting township teenagers interested in opera. The opera is sung by a cast of professional singers, accompanied by piano and percussion, with its chorus is made up of teenagers from local schools. There will be five performances at the Buxton Opera House with five different sets of ‘Orphans’ from schools in the region. The Koombu Project aims to alter perceptions of opera as an elitist medium and encourage youngsters who do not normally have access to music to perform on the Opera House stage. Alongside all this, the Festival includes a book series of talks by leading authors, thinkers and politicians of the day. Coach operators can contact John Phillips on 01298 70395, or e-mail john@buxtonfestival.co.uk for more details.